Farrar, Straus and Giroux (BYR), 9780374300746, 40pp. A fun and clever picture book retelling of Goldilocks—with pirates! Once upon a seaworthy sloop lived three pirates: the big, pilfering Papa, the medium-sized, menacing Mama, and the small, bonny Baby, a pirate-in-training. They were excellent pirates, but not very good housekeepers, so their gruel wasn't tasty, their stools weren't sturdy, and their hammocks weren't hung properly. Luckily for them, Goldenlocks happened along when they were out for a row in the harbor. 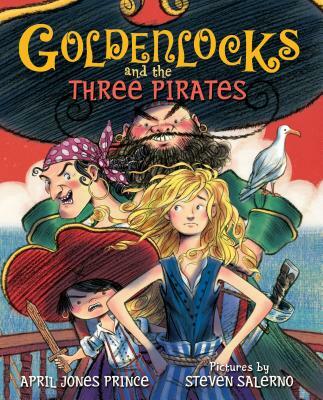 April Jones Prince's rollicking text and Steven Salerno's swashbuckling paintings make Goldenlocks and the Three Pirates a first-rate adventure and a spirited take on Goldilocks. April Jones Prince is the author of several picture books, including Twenty-One Elephants and Still Standing. She is also a literary agent. She lives in Shrewsbury, Massachusetts. Steven Salerno has illustrated more than twenty picture books, including Brothers At Bat, which made the NY Times Book Review's list of notable picture books for 2012, BOOM!, and Coco the Carrot. A graduate of Parsons School of Design, he lives in New York City.